The scout spoke to The Los Angeles Times on condition of anonymity before the draft, but he had nothing but good to say about the young San Diego State catcher Eric Christopherson. Christopherson, the scout told The Times, was one of the better college catchers in the country. "The question is whether he'll hit for a high average in professional baseball," the scout told The Times that May in 1990. "But with his defensive skills, if he hits .240 it would be a plus. . . . His baseball has improved each year (in college). He has gotten to the point where he is close to major league ability in catching right now." The next month, it was the Giants who publicly put their faith in Christopherson, taking him in the first round, 19th overall. But, while Christopherson often hit the batting average mark set by the scout, in a career that lasted a decade, he never got his opportunity to play in the majors. He started his pro career at short-season Everett, playing 48 games there and seven with high-A San Jose. Between the two, Christopherson hit .254, with 23 RBI. After arriving at Everett, told The Seattle Times about his history as a catcher, citing his grandfather and uncle, both catchers, as inspirations. "The way I use two hands (to catch), the way I set up and frame the ball are kind of a modern-day throwback to that style," Christopherson told The Seattle Times. "And I'm not afraid to take a hit." Christopherson moved to single-A Clinton for 1991, then AA Shreveport for 1992. He hit .270 at Clinton and .252 at Shreveport. His 1993 season was abbreviated at just 23 games. He returned to Shreveport for 1994, then hit AAA Phoenix in 1995. At Phoenix, he hit .220 in 94 games. It was his last season in the Giants system. 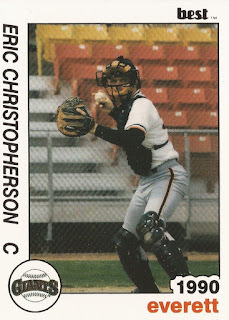 For 1996, Christopherson moved to the Astros and AAA Tucson. In 67 games, he hit .267, with six home runs. His season, though, was cut short by a knee injury. He ended up playing through 1999, playing his final three seasons for four different organizations. He played his last games with the White Sox at AAA Charlotte. In 1996, as he played for the Astros at AAA Tucson, Christopherson was just looking to impress enough to take that last step. "For the most part, they know what I can do," Christopherson told The Tucson Citizen that May. "I am just trying to do more for them."